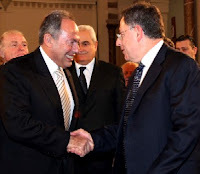 BEIRUT: With Lebanon's political deadlock tightening by the day, a meeting and a handshake between President Emile Lahoud and Prime Minister Fouad Siniora during a Mass held at Mar Maroun Church in Gemmayzeh was the focus of attention for Lebanese on Friday. The Mass, to mark the feast of the patron saint of the Maronite sect, was held amid tight security, with main access routes leading to the church blocked by security forces. No words were exchanged between the two men. Speaker Nabih Berri was not present at the Mass but was represented by MP Antoine Khoury. In addition to ambassadors and current ministers, Hizbullah and Amal's resigned ministers, as well as resigned pro-Lahoud Minister Yaacoub Sarraf, were also present. Beirut Maronite Bishop Boulos Matar led the Mass, stressing his pleasure at seeing Lahoud, Siniora and Berri's representative present "to celebrate this day jointly in prayer and we ask God ... to strengthen our resolve to exert all efforts and unify our ranks and extricate our country from the worrying shocks and crises it is going through." Matar said the sects in Lebanon have been "united in good times and in bad." He added the Lebanese have learned to live together in unity and peace and their "coexistence" is a mark of distinction for which they are recognized around the world. "As our Constitution stipulates that no authority is legitimate if it breaches the principle of coexistence, then it behooves us all not to violate this principle with our own hands in any way whatsoever," Matar said, calling on people to respect one another's rights. He said the government was "an umbrella, without which the country remains unprotected." "Let us solve our problems today and search for solutions without weakening our country or risking its extinction, but to preserve it the way we preserve our national unity and coexistence," Mattar said, adding that the people protect their government as the government protects its people. He urged political leaders to declare a national state of emergency and unite to lead their country out of crisis, adding that it was time for unity, not division. Maronite Patriarch Nasrallah Butros Sfeir, leading a Mass at Bkirki on Friday, said the hurdles the Lebanese are facing "come from too much talk," referring to constant bickering on the political scene. "Every day, the media inundates us with falsehoods and illusions around the clock," he said. During a reception held by Sfeir after the Mass, Democratic Gathering MP Fouad Saad distributed a statement. The statement said the MP "feared the weapons confiscated by the army on Thursday," which Hizbullah claimed, "would be used on the internal front against the Lebanese and not against Israel, in an armed conflict that the resistance has been preparing for by training its fighters in Syria and Iran." Minister of State for Administrative Development Jean Hogassapian, speaking to Voice of Lebanon radio, said the matter of the weapons is currently in the hands of the military judiciary. He added that UN Security Council 1701 "has placed new parameters for dealing with the resistance's weapons." "No doubt the issue of the weapons has political overtones, we just hope this matter does not become a divisive issue ... at a time we are most in need of a political climate that leads to resolving the problems we face today. We urge calm and a return to the constitutional institutions to solve this problem," Hogassapian said. MP Robert Ghanem, also speaking to Voice of Lebanon, said that since the Lebanese Army moved to the South and since all parties - including Hizbullah - agreed to the terms of 1701, "the issue falls outside the activities of the resistance and what it used to do before the summer 2006 war." This came a day after Defense Minister Elias Murr announced that there were "intelligence reports of a possible operation against the UN peacekeeping force in the South." Murr told the Lebanese Broadcasting Corp that militants at the Ain al-Hilweh refugee camp were plotting against the United Nations Interim Force in Lebanon. He said the threat was being investigated closely. Murr also said that the army commander, General Michel Suleiman, had expressed a wish to resign due to the "prevailing situation" in the country but the minister said he asked the veteran officer to be patient. The resignation "was not accepted and will not be accepted," Murr said.